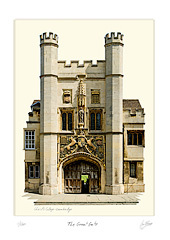 Christ's College was first established as God's-house in 1437 by William Byngham, a London parish priest, for the training of grammar school masters. God's-house moved to its present site in 1448. Lady Margaret Beaufort, the mother of King Henry VII, decided to enlarge God's House and in 1505 the College was re-founded by her as Christ's College. The Great Gate which leads into First Court was built before the foundress died. As the street level has risen over time, the bottom of the wooden entrance gates had to be removed. A statue above the gate shows Lady Margaret holding a bible. Below her are the Tudor rose, the Beaufort portcullis and her coat of arms held by mythological ‘yales’ or deer.